Hi everyone! A huge and heartfelt thank you to all those who participated in May's ePlay challenge with the theme of Stencilling. We had so many fabulous entries and it was a joy to visit everyone's blog to see the details. We really appreciate your making the challenge so fun and successful. Without further ado, and after a great deal of considering, discussing, and visiting, the winner for the May challenge was chosen. Suman's process and projects were very creative and unusual. We loved the beautiful colour palette, the dimension, and creative choice of substrate in the glasses case. Great use of stencils and embossing paste. Congrats, Suman. Please contact Kim at kim@eclecticpaperie.com to claim your $25 gift certificate prize. We would also like to make special mention of two other projects which were entered into the stencilling challenge, although again it was difficult to narrow it down to just two. 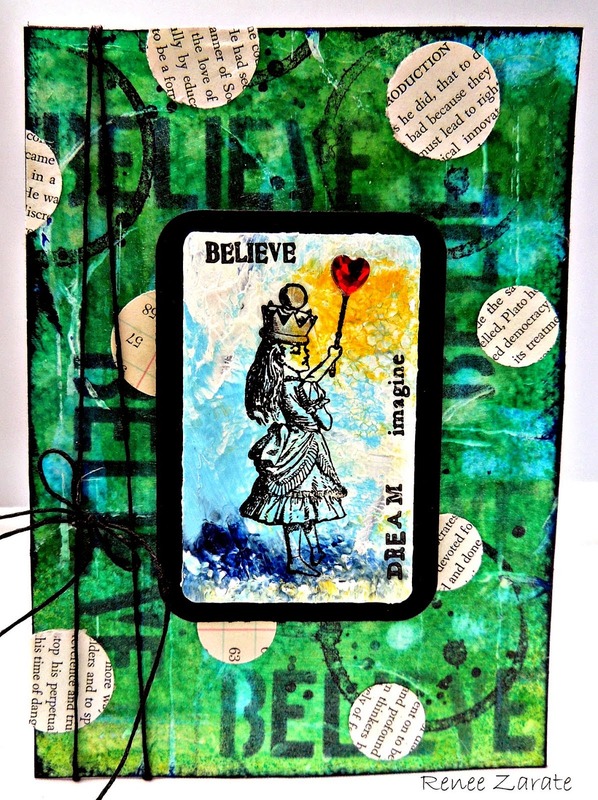 Renee created a fabulous background of layered colour, stencils, and stamping. The contrast and the vibrant colours are lovely, as is the depth. 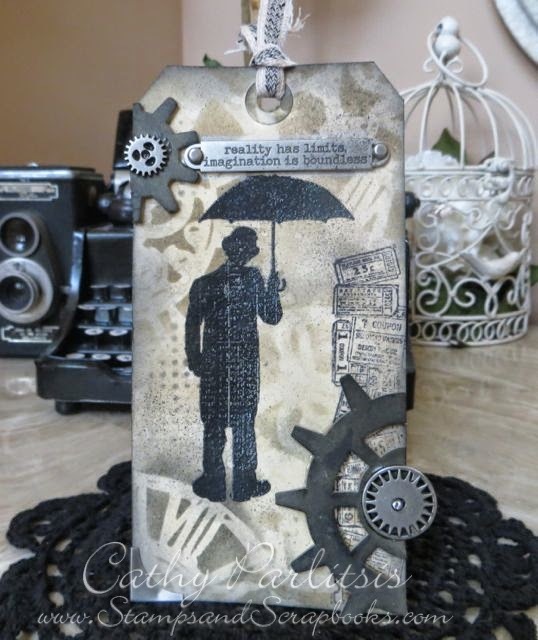 Cathy created a fantastic background for Umbrella Man using Distress Stains over which she layered Distress inks through TH Layering stencils. Gorgeous tone on tone effect. Our current ePlay challenge is hosted by our very own uber talented Andie Templeton who has chosen the theme of Fabric. You can see Andie's beautiful fabric covered journal and her step by step tutorial here. You will find tons more inspiration in the DT projects found in the thumbnails below Andie's post. We're really hoping you will play along with us for this ePlay Challenge. Congratulations - all of the projects entered were awesome. Thank you so so much, team Eclectic Paperie, so happy that you liked this project of mine !! Congrats to you all. What beautiful art to choose from. Great talent. Thanks so much for the honorable mention! I'm so glad you liked my card. Congrat's Suman! Your projects are gorgeous! CONGRATS to the winners! So many BEAUTIFUL projects in the ePlay Gallery and YOURS were just Gorgeous!